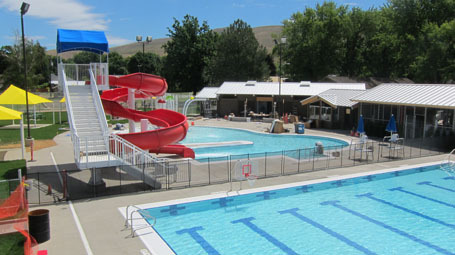 In the summer of 2011, the residents of Prosser became the proud owners of a brand new aquatic center. The existing pool, constructed in 1957, provided 53 years of service and memories for the residents of Prosser. The aging facility had deteriorated to such a degree that daily operations were difficult and expensive due to ongoing repair costs and water loss. The newProsserAquaticCenterwas designed to last for the next 50 years and beyond, providing safe and exciting opportunities for all to learn to swim in a family-friendly recreation environment. The new aquatic center consists of two pools. The existing eight lane 33-meter pool was shortened to a standard competition length of 25 yards. Although the pool still features eight lanes for competition, it also has increased recreational opportunities. The 4,425 sq. ft. pool features a dramatic 27-foot-long drop slide, which plunges into 9 ft. of water, removable floating lane lines for open swim times, and water basketball and volleyball equipment. The second pool was designed specifically for recreational use. This 2,100 sq. ft. pool includes a zero-depth entry making movement in and out of the water easy for all ages. Other amenities include a full size interactive play structure within the pool, a 100-foot-long waterslide and other play features. This pool supports multiple opportunities for new programs.